Mark Pimentel, MD, FRCPC is Director of the Gastrointestinal Motility Program and Laboratory at Cedars-Sinai Medical Center. 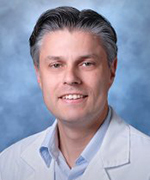 Board certified in internal medicine and gastroenterology, Dr. Pimentel has been awarded various investigator-driven grants related to gastrointestinal motility. His primary research interests involve irritable bowel syndrome and its relationship to small intestinal motility and bacterial overgrowth. Other interests include gastric motility in diabetes. Dr. Pimentel is a member of several professional organizations, including the Medical Council of Canada, American Gastroenterological Association and American College of Gastroenterology. He has written articles for such peer-reviewed publications as the Archives of Internal Medicine, American Journal of Gastroenterology, Journal of Clinical Gastroenterologyand Digestive Diseases and Sciences. Dr. Pimentel received his bachelor’s and medical degrees from the University of Manitoba in Winnipeg, Canada. He completed his internal medicine residency at the University of Manitoba Health Science Center. His fellowship in gastroenterology is from the University of California, Los Angeles Integrated Training Program.